All 108 colors are available.Please just select any colors you like.Do not forget to leave me a message about the color number and color name you like.Thank you very much !!! Dear friend,if you did not leave a message about the color , we will send all black! And will not accept the color change, as we need to fast delivery. 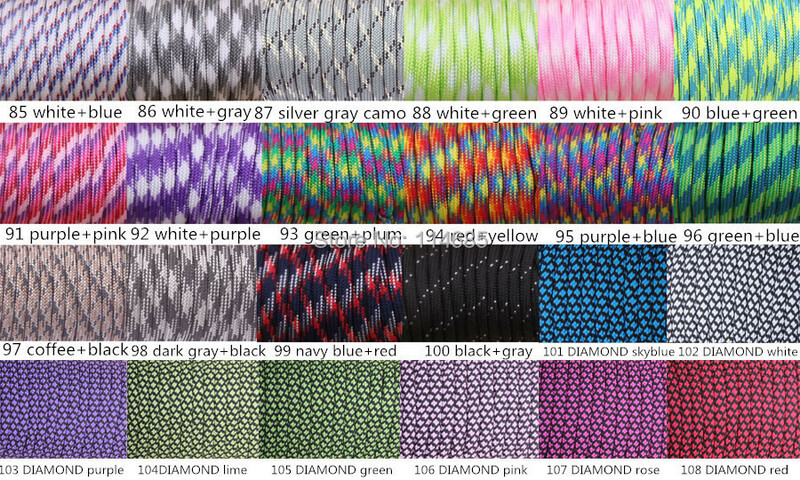 (1)We are the factory make paracord and paracord survival bracelets.Our factory can satisfy customers according to their needs,such as different styles,colors and sizes .We can also offer design service,and OEM orders are highly appeciate.We are looking forward to establishing long-lasting business relationships with you in the near future. (2)If you need fast shipping service,please let me know.We can offer EMS ,DHL and Fedex,etc.Please just place the order but do not pay for it.After I adjust the total price for you, then you can pay the bill. (3)If you need large number of paracords,bracelets,and paracord accessories,buckle,etc.please contact me,I must give you a factory price. (4) I am an honest and friendly person,if you have any need or questions,please feel free to contact me,I will reply as soon as possible for you ,and if you do not satisfied some thing after order,please contact me ,I must try myself to service for you and give you a satisfied reply.I wish all my customers happy everyday.Thank you very much !! !